I've been enjoying a new podcast from the Diocese of Missouri called "Jesus Hacked: storytelling faith". The most recent episode is an interview with the Bishop of the Diocese, the Rt. Rev. Wayne Smith by Shug Goodlow, the head verger at Christ Church Cathedral, St. Louis. The introduction to this episode made reference to the bishop's interest in fountain pens, shape note singing, and Holy Week – all interests I share! belonged all my life, and I just didn't know it. Just didn't know it existed." Shug Goodlow: You came home without realizing that you weren't home before. Wayne Smith: That's just it. I was raised in the Presbyterian Church, and I think it was my freshman year in college when I decided that I really should go to church on Easter (not having started working in one at that point, and doing the typical college student thing of just being a little too lazy to really attend church). And so I did. I went to Christ Church in Oberlin, Ohio because my friend Tim played the organ there, and I knew the music would be good. I should back up to say that I had attended an Episcopal Church once or twice before, and I had even played at one (St. Andrew's, Pearland, Tex., if you must know). But the day that I played my first Episcopal service I was too apprehensive about hitting all my cues right to really notice anything about the liturgy. There was also something too "new" about my previous visits to Episcopal Churches, but at least I had been, and I think this must have paved the way for what happened on Easter. And what happened that Easter at Christ Church, Oberlin? I came home. I felt, just as the Bishop describes, like the Episcopal Church was where I belonged all my life. I just didn't really know that it existed. I remember a lot about that first Episcopal Easter liturgy. I remember singing the Robert Powell Gloria. I remember how lovely and tuneful it was, and how it felt so good to sing surrounded by sound from the rest of the congregation. I remember how many books there were to juggle (there were a lot). But the thing I remember most is coming forward to receive Holy Communion. There was something that clicked then. It was emotional, or spiritual, or whatever you want to call it. Meeting the Risen Christ in that Sacrament within that Liturgy within that Parish – that was an Easter that I will always remember. It was Christ who welcomed me home. Since then, of course, I've had the incredible good fortune to pursue a career as a church musician, working mostly in the Episcopal Church. And one of the best parts of this liturgical Christian tradition, as far as I'm concerned, is the Easter Vigil (called "The Great Vigil of Easter," by the Book of Common Prayer). eccentricity, the Great Vigil of Easter is my favorite service of the whole year. awareness even to the point of boredom. I love the Easter Vigil. The Easter Vigil was part of my inculcation into the Episcopal Church beginning in 2003. And I participated as a musician in the Easter Vigil every year until 2015. Last year I had the great fortune simply to attend one, and I intend to do so again this year. My understanding is that the Vigil I will attend this year will include all of the readings from the Hebrew Scriptures (there are nine). This will be the first time that I have ever been present for a "full" Vigil where nothing is omitted. vibrato, for example. It's loud. It's very forgiving, as is the community. around and know that I am part of that music, also. Good congregational singing must feel a bit like singing Shape Note music – an experience I confess I've never had. Earlier this year I went down the rabbit hole on YouTube exploring the Shape Note repertory to research a few seconds of music I was going to direct for a recording. It really is marvelous, and I know that participating in it first hand must be even better. The videos that really interested me were from the Missouri State Sacred Harp Convention, all of which seems to be on YouTube. You see the assembly sitting in their sections, all facing in. A number is called out. Someone steps forward to lead. And the song erupts. It's impressive. 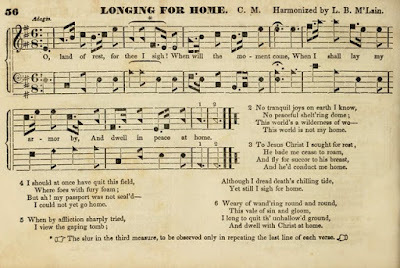 I came across all this in looking for a smidgen of appropriate choral music to sing on this recording before Zachary Wadsworth's splendid Variations on an Old American Tune. 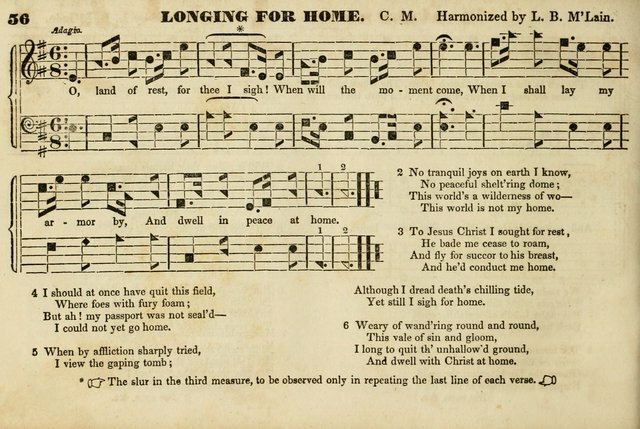 Episcopalians know this hymn tune from Hymn 304, "I come with joy to meet my Lord". Most everybody else knows it from Ken Burns's documentary The National Parks: America's Best Idea. This tune comes from the Shape Note tradition. What we know as LAND OF REST takes its name from the words of an older Shape Note hymn: "O Land of Rest, for thee I sigh!" Shape Notes, the Easter Vigil, and finding a home in Episcopal liturgy. These all struck me as significant things to think about this Holy Week. Getting lost in the sound, the singing, the story. Finding a place to dwell and realizing that you were always meant to be there.